Forgive me if this comes across as a little blunt or bossy, but I believe you need to set up a separate Retreat Planning Team. It allows women outside of your team to serve and shine. It’s a great training ground for future women’s ministry team members. Your women’s ministry team members already have lots to do! Even if you’re in a small church like I am, setting up a separate Retreat Planning Team can be worthwhile. Did most of our women’s ministry team sit on the retreat team? Yes. But we had several other women join us just to work on the retreat. On every team I’ve led or served on we’ve divvied up the tasks. Here’s a list of how you might want to divide up the retreat responsibilities. 1. Food – selects menu for the weekend; purchases food if necessary. 2. Prayer – prays prior; sets up prayer room; prays over requests that are submitted during the weekend; assists with prayer stations (if used). 3. Decorations – creates, purchases, and installs décor for the weekend. 4. Worship & Music – selects music; performs music at the retreat; recruits others to help with music; oversees all details related to music sung and played (intro, reflection time, etc.). 5. Registration – recruits women to assist with registration tables at church; compilies registration information into a spreadsheet; works with others to create registration form; matches up roommates and carpooling needs. 6. Goodie Bags – purchases items for and assembles goodie bags for attendees. 7. Welcome Table – welcomes women at the retreat location; distributes programs, goodie bags, name tags, and other necessary materials. 8. Publicity – creates and distributes retreat publicity including registration forms, Sunday bulletin announcements, church newsletter articles, small group flyers, and bathroom stall flyers. 1. Icebreakers & Games – task one woman or a small team with leading the icebreakers for the weekend. 2. Photography – it is great to have at least one person dedicated to taking photos of the weekend. 3. Technology – you may need to run the tech equipment – microphone, power point slides, and worship music. 4. Free Time Activities – you may want to research and distribute information about what is available in the area for your women to do during their free time. 5. Program – you church staff may be willing to take on this task. If not, you’ll want someone to format the retreat program with a uniform font, style, text size, etc. 6. Service Project Coordinator – many groups work on a service project during their retreat (often that first night). 7. Discussion Group Coordinator – prayerfully recruits women to lead the discussion groups; provides training for the group leaders; may place attendees prayerfully into groups. 8. Speaker Assistant – assists the speaker in any way needed throughout the weekend; makes sure there is water at the podium; oversees meal arrangements (some speakers wont’ eat until after they speak). In smaller churches women may need to help with multiple areas. In larger churches, you may be better able to spread out the work. I will admit, most of the time our women’s ministry team has already selected the location, the date, and our speaker for the retreat before we pull together a retreat planning team. Your women’s ministry team has already prayed through and agreed upon your theme/focus for the year. Too many cooks in the kitchen can make decision making more difficult. 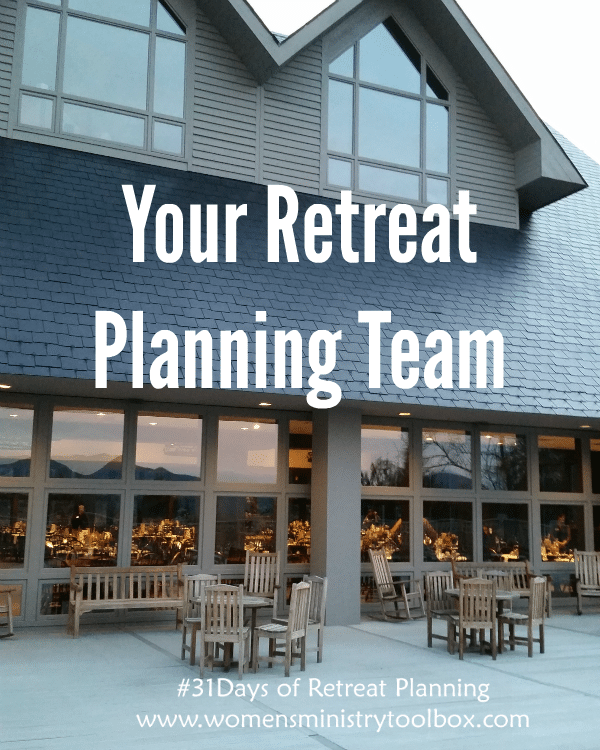 You may have needed to make those decisions (location, date, speaker) many months before you needed to assemble a Retreat Planning Team. A one year commitment for the Retreat Planning Team may discourage many women from serving. You may have a few other retreat team questions. When should your Retreat Planning Team start meeting? 4-5 months prior to the retreat date. You need to meet at least a month prior to starting retreat registrations. I’ll share more on registrations in a future post! How often does your Retreat Planning Team need to meet? Once a month, with 2 meetings the last month before the retreat. The last meeting may be a “working” meeting to assemble programs, name tags, goodie bags, etc. or a prayer meeting. The expectation is that the smaller teams (music, registration, décor. etc.) will meet and communicate on their own as needed. What do you discuss at your Retreat Planning Team meetings? We always have a time of prayer for the retreat. Every contact person gives an update, shares prayer requests, and requests help if needed. We communicate our speakers’ needs, if there are any. We give updates on registration numbers. We discuss and work to solve any other issues that have come up. Does the women’s ministry director/leader have to be the Retreat Team Planning Coordinator? Not necessarily. Some women’s ministry teams have a Retreat Planning Team Coordinator position. The Retreat Planning Team Coordinator needs to be passionate about the vision for the retreat. This is a decision you’ll want to make a matter of prayer. I’ll admit, I’m a bit of a control freak, and turning the retreat over to someone else would cause me a lot of stress! 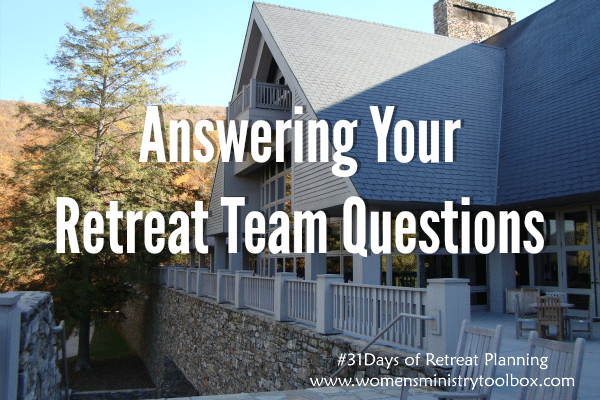 What other questions do you have about pulling together a Retreat Planning Team? Yes! Kim – let me know if I can connect the two of you! Thank you Teresa!! We are having a planning meeting Tuesday. Our ladies conference/event is January 23rd. Love to reach out to Kim. We have a fantastic ladies committee and yes, we are a small church. Last year we had 110 ladies attend from all over. My sister flew in from Nashville. We have found a January event draws the most women. And, we only have a one day conference. It is two sessions and we bring in a speaker. We have our lunch catered. It has worked beautifully. Kim, I don’t know where you live but I have some great speakers I could recommend to you. Cyndee could give you my email address. Kim, thank you for your feedback! It is MUCH appreciated! 🙂 I would love to hear how your retreat goes! Kim, Oh how I understand where you’re coming from! We attend a small church too. Our team has actually decided not to do a retreat next year because it is so much work and wears our core team of ladies out! Anything you can do to lessen the load will be helpful. Can you cater in some of the food? Maybe order box lunches from someplace nearby? Let them eat lunch or dinner out as part of their free time. Maybe you could find an inexpensive speaker to come lead all of your sessions, instead of leading sessions or workshops yourselves. Take a good hard look at your list and see if there’s anything you could do without. You don’t have to have a prayer room. You don’t have to research or lead free time activities. Maybe your small groups could be fluid and not have official leaders. We were supposed to have small group leaders, but our room set-up was different than we expected. Women naturally stepped up in each group. It wasn’t as big of a deal as I thought it would be. If you do a 2 night retreat, maybe you could try a 1 night retreat? Do any of those ideas seem like possibilities? Great series on Retreat Planning. A definite help for our women’s group for future retreats.